Derek Ryder needed a new mobility scooter, so two ladies at his favourite pasty shop decided to help fundraise for one. Jurgen Klopp, the manager of Liverpool football club, will get a real West Country welcome at Home Park tonight. As his team prepare to face off against Plymouth Argyle in their third round FA Cup replay, the home team is preparing a little surprise...a giant pasty. 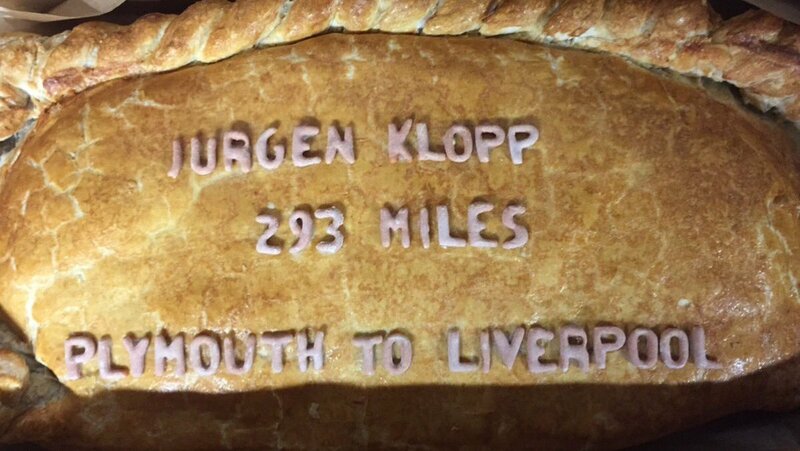 Whichever was the game goes tonight, Liverpool certainly won't be going home hungry. A Cornish businessman wants to build the country's first pasty museum in Cornwall and hopes it'll be open by next summer. A Cornish businessman wants to build the country's first pasty museum in Cornwall. Redruth is the venue for the first ever Cornish Pasty Festival this weekend. The pasty has been the staple diet of working men across Cornwall and beyond since the 18th Century, and now the iconic self-contained, portable meal and its international ties will be celebrated. The festival will also highlight Cornwall's international links with Mexico dating back to when migrating Cornish miners took their expertise and traditions, including the Cornish pasty, to new mining regions around the world. The three-day event starts with Miners' Day on Friday. Pasty Day on Saturday will see pasty producers and Cornish produce suppliers turn the town centre into a lively street market. On Sunday, former miners will be remembered at Basset Stamp House and St Euny church. The day commemorates thousands of Cornish men, women and children who laboured hard underground to meet the challenges of a rapidly evolving world. The government will be asked today to withdraw its controversial plans for a so-called pasty tax. Plans to extend VAT to all cooked takeaways led to protests organised by the Cornish Pasty Association. Today Cornish MP Stephen Gilbert will propose that it should NOT apply to food that's been allowed to cool before sale. The Government has agreed to consider a compromise on the so-called pasty tax. A delegation led by Cornish MP Stephen Gilbert is proposing that VAT should not be paid on cooked food which is allowed to cool before sale. Members of the pasty industry plan to lobby the Government against proposals to add VAT to hot takeaway foods. Some claim it could lead to a drop in sales by up to a fifth. Kathy Wardle reports from a summit held in Truro over the so-called 'pasty tax'. Brian Stanlick, the Managing Director of Oggy Oggy Pasty Company is at the pasty tax summit in Truro. He says the tax could be devastating.